This photo of a Broward County Sheriff's Department Smart police car comes courtesy of a Floridian, who notes in his email "we set ourselves up for this one." Indeed you did. 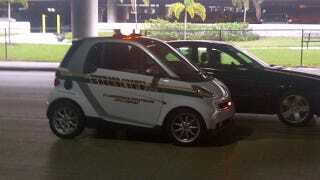 A Smart car to catch dumb criminals. Maybe less ironic and just more appropriate.